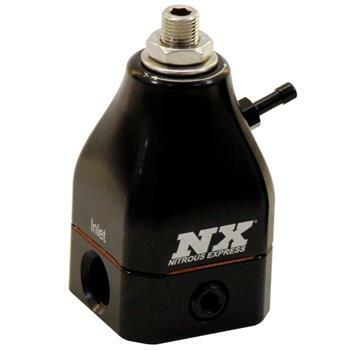 The NX billet aluminum bypass fuel pressure regulator offers accurate pressure control in a compact, lightweight package. The NX regulator utilizes two o-ring sealed 6AN style inlet ports, and one 6AN o-ring sealed outlet port. These regulator ports are NOT PIPE THREAD and utilize NO THREAD SEALANT. This regulator has one boost reference port on the regulator housing and will raise fuel pressure 1:1 per pound of boost. Optional boost/vacuum port for applications where one pound of fuel pressure increase is desired per pound of boost. To use the enclosed regulator in your vehicles fuel system, you must install the necessary adapter fittings and o-rings, high pressure fuel lines and/or fuel injector rails to adapt your system to the configuration and ports of this regulator. no fittings are included.